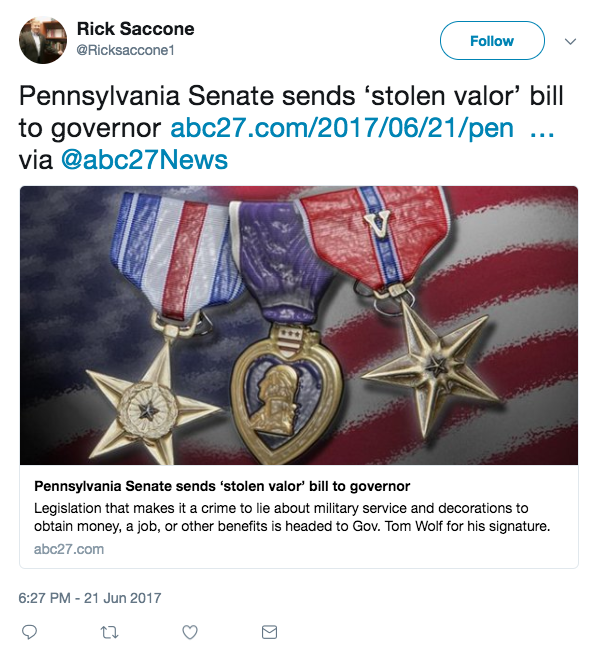 Pennsylvania is about to become one of a handful of states to have a “stolen valor” law, as both the Pennsylvania House and Senate approved House Bill 168, and it now heads to Gov. Tom Wolf’s desk for a signature. The bill would make it illegal and punishable to wear military uniforms and insignia and misrepresent claimed military service or honors. People who steal valor, meaning falsely pose as a U.S. service member, do so to receive discounts, benefits and recognition in public to boost their egos, and more. In Pennsylvania, this crime would be punishable as a third-degree misdemeanor. Rep. Rick Saccone introduced the legislation. The Pennsylvania bill unanimously passed in the House and Senate. President Barack Obama signed the Stolen Valor Act of 2013, which amended the federal criminal code. While that is a federal law, it does not mean individual states adopted the law. 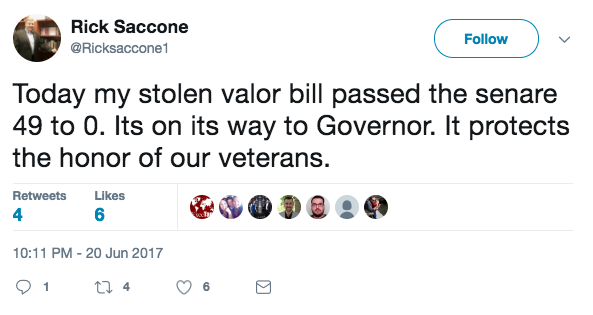 In Pennsylvania, the House passed a stolen valor bill in 2016, but the Senate did not approve it then. Saccone introduced that legislation then, as House Bill 2050, and the current House Bill 168. 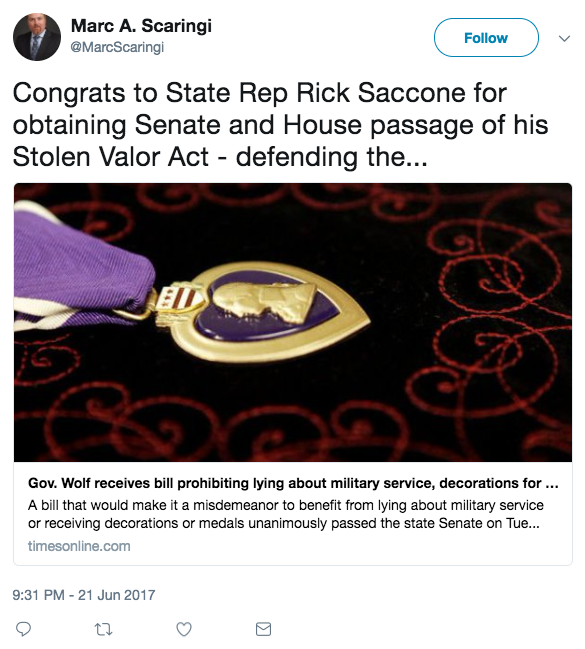 Saccone has said: “In the near future, I plan to introduce a bill that would make it a crime to fraudulently present oneself as a soldier or a veteran of any branch of the armed forces, or to be the recipient of a service medal or other military decoration when it is done with the intention of obtaining money, property, of other benefits. “This is a reintroduction of [House Bill] 2050 from last session, which passed the House unanimously 197-0,” he said, of House Bill 168. “Criminalized behavior would range from lying to receive veteran or health care benefits to fraudulently obtaining preference in a government contract or a job reserved for a veteran,” Saccone said. “While the bill does not criminalize simply lying about one’s military service and accomplishments, I would nevertheless emphasize that this legislation is not simply about unfairly obtaining an economic benefit. This kind of fraud is despicable and, in particular, it is terribly disrespectful to our nation’s veterans,” he said. “Please join me in recognizing and protecting the valor and integrity of our military awards, along with the men and women who have earned them,” Saccone added.